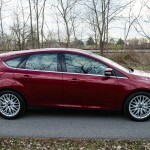 Thanks to the One Ford initiative, in 2012 the North American market was able to purchase the same Ford Focus that was available for sale around the globe. 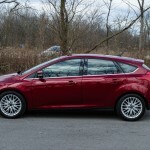 For the first time, in a long time, Americans can enjoy the exceptional handling, good looks, and better build quality that the European Focus has been able to enjoy for years. We spend a week in a top-level Titanium version to see for ourselves what the world’s auto press has lauded for years. But let’s cut to the chase, the Ford Focus is a very good car. Now, let’s go into details on why. 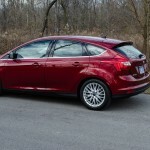 The Ford Focus has been a global selling success, and the American version is just as good. It doesn’t really take that much to build a nice driving car. The Focus falls into that category. Much like the Fiesta we like so much, the Focus drives just as well. 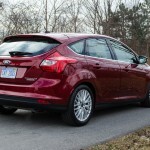 In fact, driving the car feels even better, because the Focus is a wider vehicle than the Fiesta. 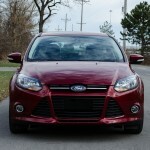 I cannot stress this enough; the Ford Focus handles exceptionally well. Being a front-wheel drive vehicle it will still understeer when pushed, but handling is predictable. It might not quite as nice to drive as the ST version, but the Titanium does get top marks in this area. The Focus Titanium looks great as a hatchback, and provides more room than the sedan. The Titanium Focus features a naturally-aspirated 4-cylinder engine displacing 2.0L. 160hp and 140lb/ft of torque is on hand to power it along. Does it feel fast? No, it doesn’t. However, there is plenty of power on tap to overtake on the highway or get around town. 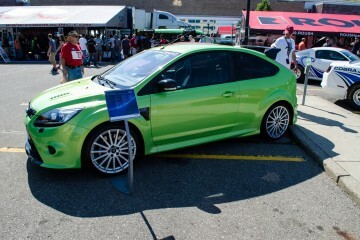 For those looking for more power, there is always the Focus ST. The Focus Titanium has unique wheels for the trim level. 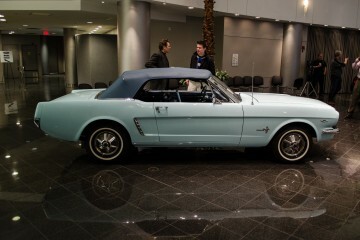 Ford has come along way with the PowerShift dual-clutch transmission. 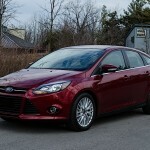 The programming in the Focus is pretty decent, and shifts seem noticeably faster than when we’ve tested other models. It does not shift as fast as BMW’s DCT, but when driven aggressively the shifts are pretty crisp. However, do not use the manual mode on the shifter. Shifts are too delayed and it doesn’t make the drive any sportier. 2014 will be the last year for this front bumper design on the Focus. Fuel economy is also pretty decent. 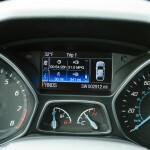 During our road trip test, the Focus managed to achieve 31.0mpg. That’s respectable, but not the absolute best. 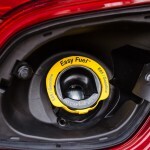 For those wanting better fuel economy, there is a SFE package on the SE model that ups the mileage to 40 mpg on the highway. The Focus has a futuristic-looking interior with decent materials. Being a Titanium model, there are a lot of features that come standard on this car that would normally be options on a lower level. 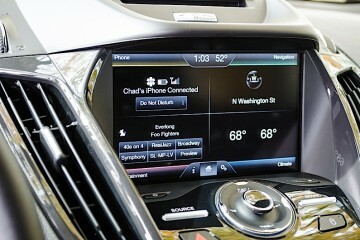 MyFord Touch is standard, only requiring the additional $795 to add the navigation element. Leather seats with heating is also standard on the Titanium, and there is even a subwoofer in the trunk for better sound. 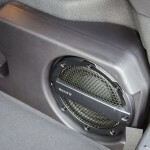 The Titanium trim level features a premium Sony stereo with a subwoofer. The seats and steering wheel are still manually-operated though, which is a little odd on a luxury trim level. The Escape Titanium earlier in the year we reviewed had power seats and memory. 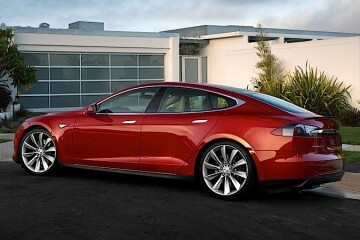 One item that is annoyingly absent is a automatically dimming rear-view interior mirror. My SES Fiesta (now called Titanium) has the mirror, but the more expensive Focus does not. It may seem like I am nitpicking but this really bothered me during the week of driving. Since the Escape and Focus share interiors, it doesn’t seem to be that difficult to share the same parts. 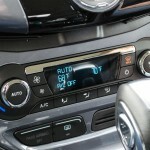 MyFord Touch is standard on the Titanium trim Focus. But I digress. 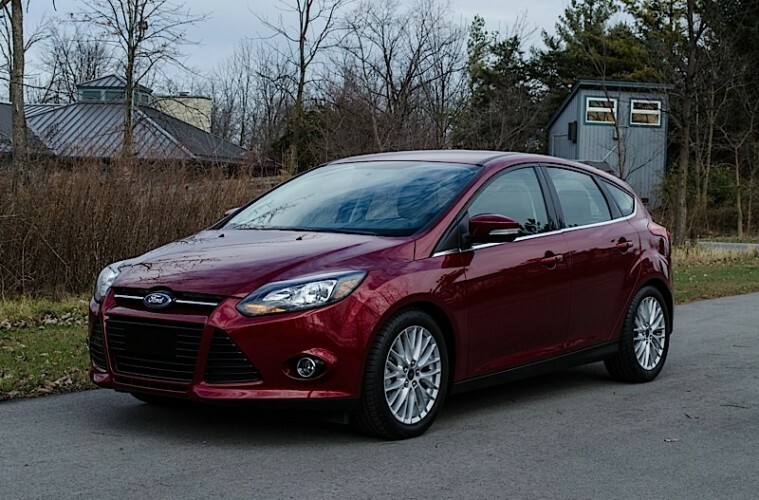 The Focus is a comfortable car with decent rear-seat room. In addition, being a hatchback allows for even more space in the rear to haul things. Fold flat the rear seats and hauling a chest of drawers is a cakewalk. The standard rear-view camera and rear parking sensors make parking a breeze. Ultimately, the inside of the Focus is a nice place to be. The Focus interior is very driver-centric. When it comes to safety tech, the Focus does lack a few items that the Escape does have. The Focus cannot be ordered with blind spot monitoring or rear cross traffic alert. These are nice features that are understandably not standard, but still should be options. I’m sure many people would opt for the technology as these systems keep getting better and better. 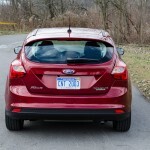 The hatchback has a sculpted rear-end with taillights that fit the design language of Ford. I’m also slightly bummed out that the Focus Titanium cannot be ordered with HID headlights. 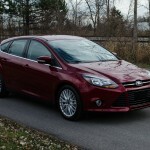 The Escape has them as part of an option package, and the Focus ST also has them as an option. I personally believe that HID lights are a safety option. In rural Ohio where I live, HID lighting makes spotting the rogue deer much easier and prevents the unfortunate insurance claim. 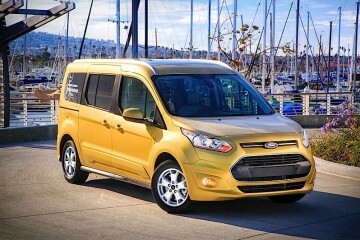 The Titanium trim level is designed to be a more luxurious trim level, and brings the model naming in line with Ford’s European operations. This typically means that the Titanium trim levels will have the latest and greatest in technology. 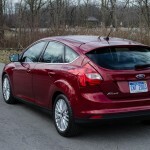 The Focus, along with other Ford products, does not have a gas cap. Ford’s MyFord Touch system in our review unit had the latest version of the operating system, which is fantastic because it fixed a few of the grievances I had about the system. In previous versions, from the home screen, if the driver wanted to select one of the four quadrants, he or she would have to tap the little color strip in the corner. On the new version, they just have to tap anywhere in the quadrant. That is much easier to do when driving. Also, with iOS 7 Sync will read text messages aloud. However, Sync still cannot reply to text messages, because Apple doesn’t fully support the Bluetooth profile needed to make that happen. 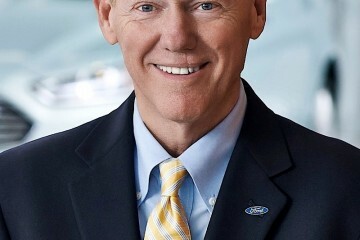 The Ford Focus is a car. It does car things, and will safely and comfortably haul friends and family around. 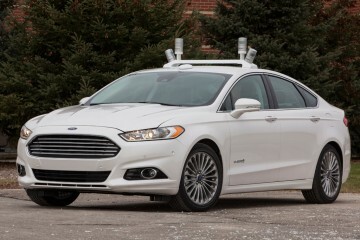 But unlike other cars, the Focus will be fun to drive when it is used for those tasks. There is ample space when the purchaser options the hatchback (and it’d be silly not to, I believe it is a better looking car), and rear-seat legroom is decent for adults for shorter trips and children for longer trips. Rear seat room is adequate on the Focus. 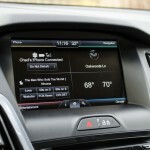 Ford has been continuously upgrading MyFord Touch since launch to improve speed and performance, and the current version works pretty well. We would like to see voice commands to happen quicker, and the map screen seems to re-draw slowly during a zoom, but the system is a hundred times better than when it launched. Speaking of better, the automatic transmission no longer feels like a young child who just got his or her driver’s license driving a manual. That is a good thing. 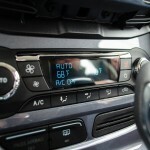 For those who may already have a Focus or Fiesta with the automatic, make sure you call your dealer and see if there is a transmission control software update available. I know there was one for my car and it made all the difference in the world. 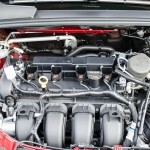 The 4-cylinder engine in the Focus makes decent power and good fuel economy. $26,100 seems like a lot of money for a Focus, but the average price of a new car these days is well over $30,000. The Focus still seems like a good value to me, considering the options that come with the car and how fun it is to drive. Ultimately, I would get the ST version, but the Titanium does have more creature comforts and would be more comfortable to drive year-round. Also, the Titanium is sporty enough for people who like to drive but maybe do not know how to drive a manual-transmission (which is the only transmission option for the Focus ST). Need a family car that doesn’t break the bank? Make sure the Focus is on your list!